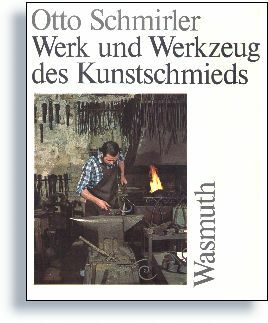 Translated literaly, Work and Methods of the Artsmith. 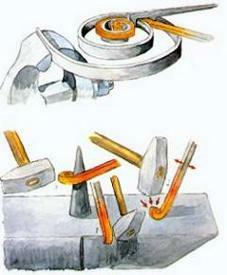 Schmirler's book is probably the best illustrated of any blacksmith book and covers basics as well as advanced techniques. Schmirler's water colors are worth the price of the book alone but there are also hundreds of closeup photographs of beautiful ironwork. The book has German, French and English text. But it is so well illustrated that an illiterate could learn as much from it as anyone else. The dozens of water color illustrations clearly show every detail of hundreds of tools. These start with Schmirler's anvil made from his pattern and go on to show the type of special tools that take a life time to develop. There are more types of anvil tool shown than I have seen in any other book OR shop. The selection below is just a few of what is probably hundreds. Many have matching or complimentary top tools. 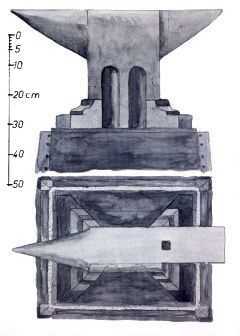 Many basic and advanced techniquies are illustrated. Drawing and tapering, pointing, fullering, setting down, flaring, heading, forming tennons, cutting, punching, piercing, upsetting, scrolling, twisting. . . The range of tools also include Schmirler's treadle hammer and scrolling jigs. 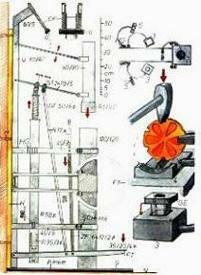 Click center image for detail of the treadle hammer. All the photographs of forging operations were taken in the "Old Smithy," Otto Schmirler's old shop, now a museum, in the heart of Vienna.